Cebu City, Philippines - Local chess aficionados marked a historical event with the implementation of the Philippines’ first “Chess in Schools” program involving the private school sector. 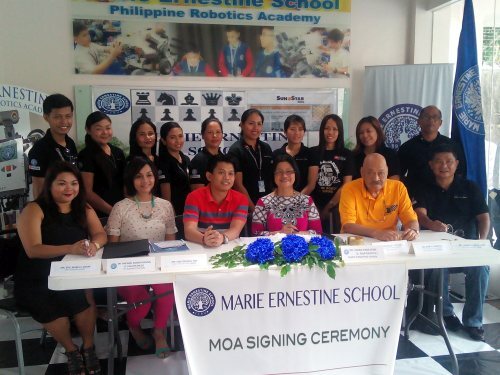 The Marie Ernestine School Philippine Robotics Academy will include chess into its K-12 curriculum starting next school calendar in partnership with the Cebu Chess Masters (CCM) and Cebu School of Chess (CSC). The Cebu Chess Masters will handle the Marie Ernestine Talamban Campus and the Cebu School of Chess will take charge of the Lapu-Lapu City Campus. Dr. Marie Ernestine Fajatin, the school founder, Therese dela Torres of CCM and International Master Kim Yap of Cebu School of Chess signed a memorandum of agreement last May 29, 2015. National Master Merben Roque and Michael Pagaran of CCM and Carlos Moreno and Marvin Ruelan of CSC are going to teach the students to become excellent players. They will also train the school teachers who will also help implement the chess in schools program. The agreement signing was witnessed by the Cebu Executives and Professionals Chess Association (Cepca), represented by its officers Jojo Muralla, Frank Pestano, Jun Olis, Jun Kidlat and Nick Climaco. Dr. Fajatin said incorporating chess into Marie Ernestine School’s educational system will help the school in its mission to develop the children’s analytical and critical thinking. 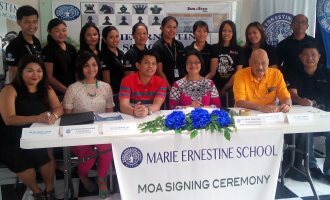 Marie Ernestine School is a private educational institution in Cebu, Philippines that has been in the education industry since 1976. The school aims to foster the holistic development of its student through a dynamic curriculum and programs that are specially crafted for its studentry. The curriculum and programs are in line with international developments in education and intended to primarily serve Cebu’s multinational community. Fajatin added that some of the benefits of chess include improving self-confidence, developing patience, maximizing focus and attention and helping prepare the children to become strategists. Chess also enhances Mathematical skills and it is an application of Geometry, Calculous, Algebra and Trigonometry. Dr. Fajatin also said she wanted Marie Ernestine School to produce chess Grand Masters and students who will compete in chess tournaments around the country and in Asia, the way the school is competing in many robotics tournament. Yap, who founded Cebu School of Chess in 2014, said he also wants his school to help in producing more chess masters from the Philippines. It has always been his dream to open a chess school that will help promote chess in Cebu, will provide an excellent training ground for chess enthusiasts, and will help prepare players to compete in national and international tournaments. The Cebu School of Chess offers group and private training with trainers ranging from veteran untitled players to a grand master. Chess is incorporated in the scholastic curriculum of about 40 countries across the globe, including Brazil, Spain, Armenia, Venezuela, China, Singapore, Israel, Italy, Russia, Turkey and Greece. One of the prime movers of Chess in Schools is former world champion Garry Kasparov, a Russian chess grandmaster who is considered by many to be the greatest chess player of all time. He founded the Kasparov Chess Foundation (KCF), a non-profit educational organization supported by charitable donations from concerned individuals and corporate sponsors. In the Philippines in 2009, former Education Secretary Jesli Lapus of the Department of Education (DepEd) and National Chess Federation of the Philippines President Prospero Pichay Jr. signed a memorandum of agreement to incorporate chess in schools. The memorandum stated that DepEd has a continuing program to scale up the academic and non-academic performance of children using traditional and non-traditional strategies and shall encourage playing chess as another strategy to promote the development of higher order of thinking skills, self-discipline, decision making and provide opportunities to practice such values on perseverance, honesty and sportsmanship among children. The NCFP is a non-profit organization that has the expertise in building competencies of teachers-trainers and has offered it services to help build the competencies of DepEd Chess Trainers who will form the core of chess experts of DepEd.